From the 2005 musical drama, Rent which was adapted from a Broadway musical of the same name. The story is based on Giacomo Puccini’s opera, La Bohème and depicts the lives of residents of the East Village of New York City during the late 80’s and early 90’s living under the shadow of the AIDS epidemic. 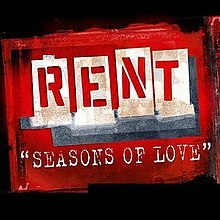 The soundtrack features, Seasons of Love which was written and composed by Jonathan Larson.